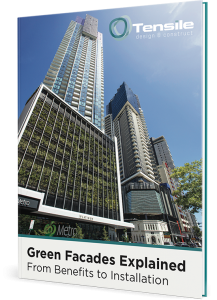 A lot of the projects we have worked on have been new building developments, shopping centres, residential apartments, car parks and community spaces. Recently we are seeing a shift towards multi storey schools. It makes sense when you think about it. A lot of schools have a limited amount of space with an increasing intake of students. So we have had to think of new ways of creating space where there is little to none. Children need different spaces to play in to learn and grow. Whilst green outdoor spaces are ideal for children to play in that is not always possible due to increasing real estate costs and the un-availability of real estate in the inner city regions. So schools are faced with the problem of children needing safe areas to play in with limited amounts of space available. With the use of Webnet mesh we have been able to create solutions for multi storey schools by maximising the usage of outdoor areas and roof tops, especially in the inner city areas. The beauty of the Webnet material is it can be installed both inside and outside. The material itself is lightweight, even though it is made from 316 stainless steel. It is strong and durable and can be shaped to fit any area. Because of its strength it can be used in playgrounds as climbing spaces, section off playground areas to contain children, provide barriers internally for spaces that have high ceilings and used on sports grounds to section off different playing areas. Because Webnet is constructed to hold up hundreds, if not thousands of kilograms, the material is perfectly safe for climbing. The mesh is capable of dealing with all levels of crowd load under AS1170. Being 94% open area the mesh allows air and sun almost uninterrupted and can be designed in such a way to remove any issues of climb-ability if that is an issue for the space it is being used in. Its durability means that it can be used outdoors and is not subject to corrosion or wear and tear from weather conditions, making it cost effective from a maintenance perspective. The mesh can also provide safety barriers between levels, whilst still maintaining transparency, sight-lines and air flow. 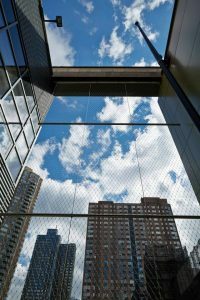 The mesh can be wrapped and shaped to not only make a roof or balcony a safe play environment it can become part of the architectural solution. Using the mesh to add design elements to schools is also becoming increasingly popular. As it comes in different colours you can make the design really stand out or blend into the background or environment to create the right effects for each design and space. The installation of Webnet in schools is becoming increasingly popular and is starting to take hold. This is true not only in Australia but around the world, such as Europe and the United States. See the work we did for the Melbourne School of Design, Webnet was used to provide a discreet protective and supportive structure whilst providing an elegant spatial design element. Because it is a highly flexible solution, it can be used to form a plane surface but can also be tensioned into three-dimensional forms featuring funnel-type, cylindrical, or spherical shapes. You can read more about it here at the Melbourne School of Design. Creating spaces where children can relax and have fun provides them with learning spaces that are enjoyable to be in. The use of Webnet inside and out of a school can do exactly that. Working on a new school or university project and interested in finding ways to maximise space or create new and interesting environments? Speak with a Tensile Design Specialist here.